Casey and Jeremy had an enchanting wedding at the Johnson County Golf Club in Smithfield NC. The wedding was held indoor as it was raining outside. Even indoors, this wedding was a great event. Casey’s family and friends did the majority of the decoration for the much anticipated day. She chose deep purple, lavender, and a pop of yellow for her colors. 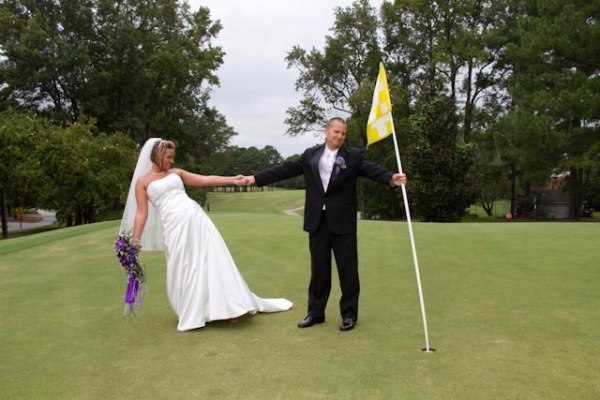 After the ceremony and family photos, the couple decided to head out to the golf course for some more pictures. The sky was cloudy and the temperature was perfect. We had a great time riding around the golf course “hitting” some of the most beautiful spots. We we finished up the photos the bride and groom were announced and got to enjoy some cocktails and hor dourves. They cut the cake, then Jeremy’s dad gave a tear jerking toast before the first dance. Afterward the guests partied and enjoyed themselves until it was time to go. At the end the bride and groom left though a blast of bubbles, produced by many excited guests, jumped in their golf cart and zoomed off into their future! Congratulations to Casey and Jeremy!